Please keep all feedback pertaining to the German translation of Scrivener's UI to this thread. There are a couple of queries I have, which I collated in a word document (sorry, not a spreadsheet because I was just finishing when your response arrived). I have ignored the missing translations (though I thought that in some cases the translation had in fact been provided already). As for word overflow and the connected font issues, these seem less an issue with the menu items but more with the text in text boxes. It’s going to be very difficult to achieve that without seeing the text, some kind of character limit or developer input. I’ve left them for now. I agree with Number 1: "anzeigen" fits better than "darstellen" in those cases mentioned. Or does an other beta team work on the translations for that? Regarding "View", "Darstellung" is preferable as it is the Apple translation, and as per my earlier feedback, the app will crash on Touch Bar machines if it doesn't use the Apple translation thanks to some rogue Apple code. "Pause" only every appears in Scrivener in the context of Pause/Play/Rewind/Forward, yes. Please ignore that. Those colour names come from Apple's colour wheel so cannot be translated. I'm not sure if there's a way of getting the translated names of those colours at all, and will look into it, but it's not something the translator can do which is why it's not in the files. Regarding word overflow, the initial brief was that translators should try to keep translations as short as possible, striving to keep them not much longer than the English translations (hard in German, I know!) since there is only so much UI space. The UI is designed to give a little more space around all text and so to have a little give (the cut off of "laden" being an exception and a bug on my end), but translations do need to be kept as short as possible. I found some missing translations and careless mistakes. The "three dots" at the menus is not used consistently. Sometimes there is a space between word/sentence and the dots, sometimes not. 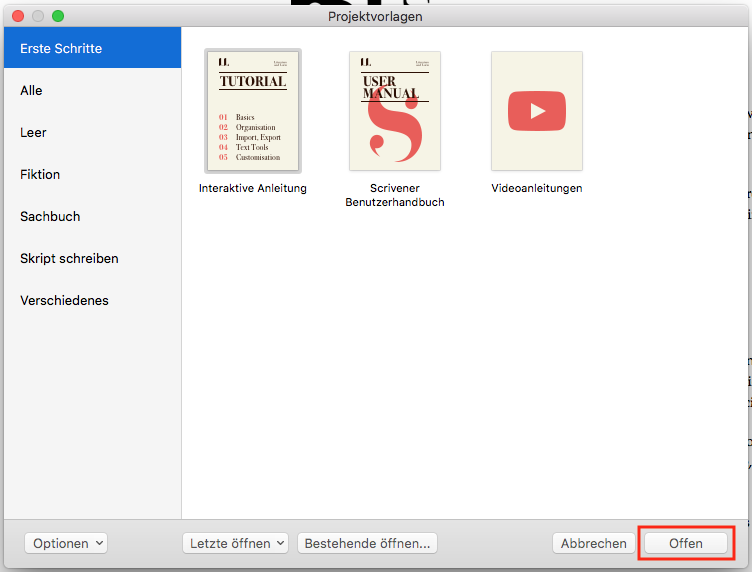 "Clear Favorites" = "Favoriten löschen"
"Add Project to Favorites" = "Projekt zu Favoriten hinzufügen"
++ "Back Up" = "Backup"
"Jetzt Backup erstellten" = "Jetzt Backup erstellen"
"as Scrivener2 Project…" = "Scrivener2 Projekt…"
"Only Show Scrivenings Titles for Folders" = "Nur Scrivenings Titel für Ordner anzeigen"
"Outliner Options" = "Outliner Optionen"
"Use Fixed Row Height" = "Verwende feste Zeilenhöhe"
"Zur nächsten Seite scrollen." = "Zur nächsten Seite scrollen"
"Open Non-Group Items in Other" = "Öffne nicht gruppierte Elemente in Anderer"
"Clear All Navigation Options" = "Alle Navigieren-Optionen löschen"
"Neu Text" = "Neuer Text"
"Website in Text konvertieren" = "Webseite in Text konvertieren"
Please find attached (COMMENT UPDATED 13.11.17 - IGNORE FILE ATTACHED - WILL ATTACHED THE CORRECT FILE) the latest version with text shortenings and revisions. Regarding the translation for “View” translated as “Darstellung” as per mac menu item, but the feedback was that the consistent “darstellen” for “to view” should be changed to “anzeigen”. I’ve tried my best to separate the two instances out and provide accordingly. There was also some discussion about “Transformationen”, but to my mind they are clear and correct and according to Mac rules as they are. In the last correction round, the term “Backup” was changed to “Sicherung” after feedback, this time round, it seems that “Backup” is favoured again. Both terms are fine and correct, and just to settle the term, I’ve kept “Sicherung”. For the missing text, I think we had actually provided those missing bits in the latest “string translation” last week. Please note that the translations offered by the beta feedback group does contain the odd issue and erroneous translation. For example, for “Favorite Projects”, the translation is “Make a project a favorite”, and also there seems to be some confusion about (single) webpage (in German Webseite) and website (as in collection of webpages) – in German Website as in English. Because the words sound rather similar in German, this is a common mistake, but I think one that should be avoided in an app. (see also: https://de.wikipedia.org/wiki/Website). This is the correct file attached. Which I have now cross referenced with the original file the translator sent me prior to this latest beta test. First, I don't like the translation for show = darstellen. I would prefer "anzeigen". Second, again I found: "Back Up Now" = "Jetzt Backup erstellten" It's not correct! erstellten -> erstellen (without the "t") I mentioned this 2 or 3 times. Why this isn't corrected already? I second that - "darstellen" sounds REALLY strange. Should be changed to "anzeigen". "Select next in same style." = "In der gleichen Formatvorlage weiter wählen." Doesn't make much sense. I would translate it as "Nächstes mit gleicher Formatvorlage auswählen". "Select previous in same style." = "In der vorherigen Formatvorlage weiter wählen." This is just wrong. Should be translated as "Vorheriges mit gleicher Formatvorlage auswählen". (If that's too long, "auswählen" could be cut off). I just looked over the latest version sent this afternoon and I’m surprised there are still a lot of errors in there. I mean, there are a couple of times we gave feedback on obvious issues like »Open«, does not mean »Offen« but »Öffnen«. And »Insert« is not an »Einsatz« (Mission) but »einfügen« (insert). I looked over it again and still find the usage of »darstellen« (several places) is not a good phrase and should be actually be written as »anzeigen«. It’s just not the way we would say in German, even if people may understand what it is supposed to mean. However, it does look wrong in some ways. Open in the context you are using it means rather »Opening« -> Öffnen than »it is open« -> »Offen« So I recommend to change it, because it’s wrong the way it shows. I have no idea what »Stichwörter-HUD« darstellen should mean. I bet a lot of Users will struggle. Do you mean bringing up the pop-up which shows the overview over all keywords? In case the answer is yes, I would write »Stichwörter Übersicht« oder »Alle Stichwörter anzeigen"
I have not seen it yet in any app to describe a »body text« and it looks very unusual. We rather say »Standard Text« or just »Text«. In this case, we have the similar sounding word: Recherche. "Back Up Now" = "Jetzt Backup erstellten"
There is a typo, one »t« too much. »erstellen« is the correct spell. Motto: "Fantasie ist wichtiger als Wissen, denn Wissen ist begrenzt"
I agree Thomas in all points. re "Korpus": It can be used as a linguistic term for a collection of source documents, but never for an HTML style... (assuming that this is what "body" is supposed to mean). Sometimes, "Body" is translated as "Textkörper", but this is quite unusual as well. I'd go with "Text" (not "Standard Text", because this doesn't make sense regarding HTML styles). Posted by sascha.mrowka on Nov 13, 2017 @ 06:30 PM - First, I don't like the translation for show = darstellen. I would prefer "anzeigen". Second, again I found: "Back Up Now" = "Jetzt Backup erstellten" It's not correct! erstellten -> erstellen (without the "t") I mentioned this 2 or 3 times. Why this isn't corrected already? Posted by alioqui on Nov 13, 2017 @ 06:55 PM - I second that - "darstellen" sounds REALLY strange. Should be changed to "anzeigen". Sorry guys I was in a major rush that day to get everything updated so Keith could submit to the app store and I have now realised I compiled the wrong version. I will post a newer version of the file later today. Thanks for your help. I will query this with the translator. "Show Keywords HUD" = "Stichwörter-HUD darstellen« I have no idea what »Stichwörter-HUD« darstellen should mean. I bet a lot of Users will struggle. "Show Line Numbers" = "Liniennummern anzeigen" should be „Zeilennummern anzeigen"
"Total columns only count documents included in Compile" = "Zusammenstellung enthält nur Gesamtspalten von gezählten Dokumenten" Sounds a bit nonsensical. Don't know what this means. My guess would be: "Summenspalten zählen nur kompilierte Dokumente"
"Make text italic." = "Text kursiv anzeigen" "Make text bold." = "Text fett anzeigen" These commands are meant to actually change the format, not just the way you view it ("anzeigen"). For the sake of brevity, I would translate it as "Text kursiv" and "Text fett" respectively. System closed this discussion on 22 Jan, 2018 03:50 PM.